When you’re the type of person who likes to head out into the great outdoors you need tools that are going to last. Your watch may not be the first thing that you think of when it comes to outdoor tools and gear, but it can definitely be an important aspect, letting you know a whole lot more than just the time of day. But choosing one can be a little more complex than you think. Gender: What gender is the watch made for? Is it designed specifically for men or women or is it actually unisex? This will generally have something to do with the size of the watch face itself and the watch band. Case Diameter: How large is the case in millimeters? This is the way most watches are measured and it lets you know whether the watch is going to be a good fit for your wrist or if it’s going to be too large or too small to be comfortable. Band Material: What is the band actually made of? You want something that you can wear comfortably and that’s going to last. Whether that’s nylon, leather, resin or something else to you is going to be all about personal preference. Waterproof: Is the watch waterproof? This is definitely an important aspect if you’re looking for an outdoor watch because you never know when you’ll drop it in water or get caught in a rainstorm with no way to protect it. Type: What type of watch are you getting? Is it a digital or analog? Once again, this is going to be about your own personal preference but it’s definitely something you’ll want to take a look at so you know what you like best. Warranty: How long is the warranty that you’re going to get? Is it long enough for you to feel comfortable making a purchase? Does the company actually stand behind the product that they have made? With so many different watches out there you could have a hard time finding the right one, at least, if you don’t take our advice. We’ve already found the top ten outdoor watches and we’ve created a list to help you narrow things down even more. You’ll find the best outdoor watches review options right here, so you can get on with your next camping or hiking trip. Here we have one of our best men’s outdoor watches, which comes from a company well known for making watches of all kinds. With a case diameter of 53 mm it’s a slightly larger option and features a resin band that’s comfortable and flexible on your wrist. The watch itself is waterproof to 660 feet, which means you can easily take it swimming and it has plenty of features, including dual-time display, light, stopwatch and even world time. 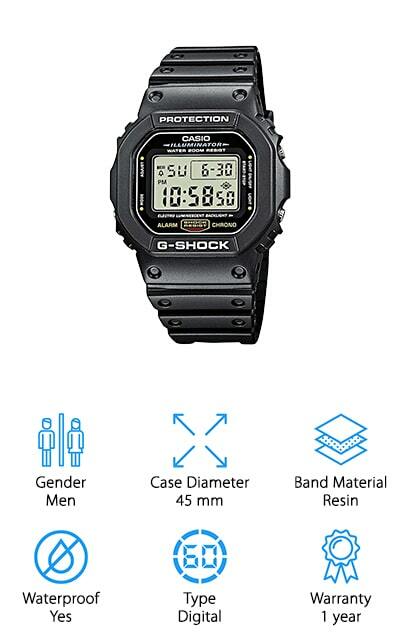 On top of that, it’s shock resistant and provides a thermometer and moon graph. Altogether you’re going to have some great features from this made in the USA watch and you’ll get a 2-year warranty to go on top of that. That means you will know you’re getting something high quality and durable for your next event outdoors. Our best cheap outdoor watch is still going to give you enough features to keep you more than happy. 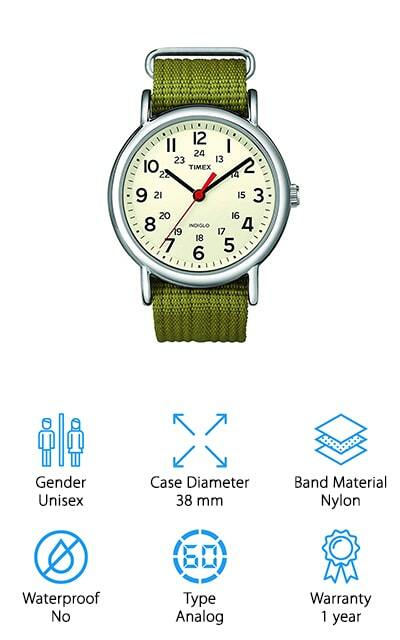 It’s an analog style watch that’s designed for both men and women. It has a nylon band that’s comfortable and adjustable to get just the right fit for your wrist. On top of that, it has a 38 mm case that’s not too large even for smaller wrists. It’s not waterproof, but it is water resistant up to 100 feet, which means that it does well with brief immersion but isn’t designed for swimming or prolonged water exposure. The light up dial makes it great even in the dark and the fact that you get to choose between different band designs means that you get to personalize this watch for your own preference. It’s a great way to show off your style and always know the time. 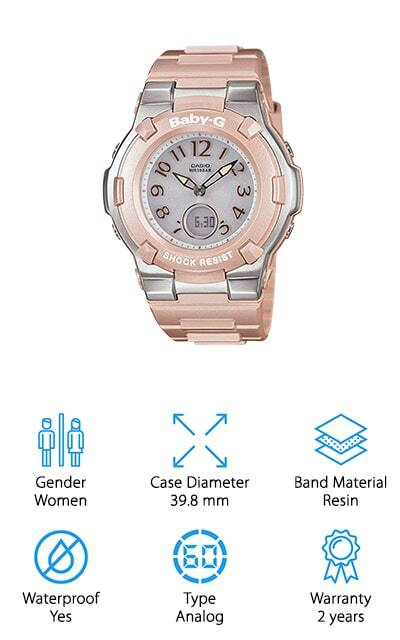 This unisex watch has a large case diameter, which can be a bit much for some wearers at 50 mm. Still, it features plenty of information that makes it a great choice for those who are going to be heading out into the wilderness whether for a short time or a long time. It has a weather trend graph and a storm alarm as well as letting you know the sunrise and sunset times in over 400 locations. With several different band color options, you’re going to have something you really like to wear as well as something highly informative. 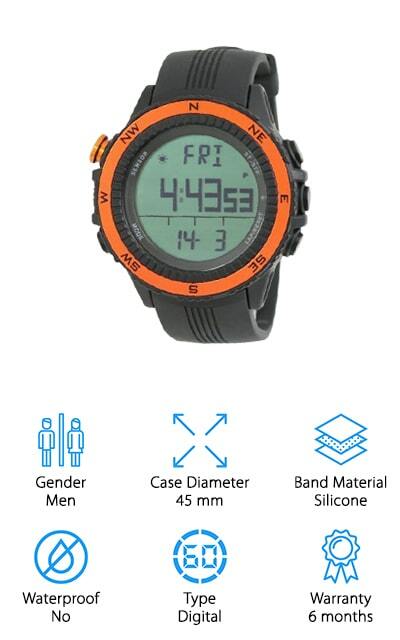 You’ll have an altimeter, barometer, compass and depth meter included in this waterproof watch. It’s even designed for use while snorkeling so you can be sure it’s going to stand up to just about anything, and it has a 2-year warranty. This is one of our top outdoor watches for a number of reasons, including the fact that it’s water resistant to over 200 meters, which means it can easily be taken along with you on a swimming trip. Shock resistant in case of drops or falls, it has a backlight to provide you with easy reading during the night and has a timekeeping mode and alarm. You get a countdown timer, auto calendar and a whole lot more with this men’s watch, designed for just about anything you can throw at it. The case diameter is 45 mm, which is an ideal size for most wrists and the watch has a resin band that is soft and flexible so you can easily wear it wherever you want to go. There’s also a 1-year warranty that lets you know you’re going to be protected. This men’s expedition watch looks sleek and stylish but it’s also great for getting out into the wilderness. 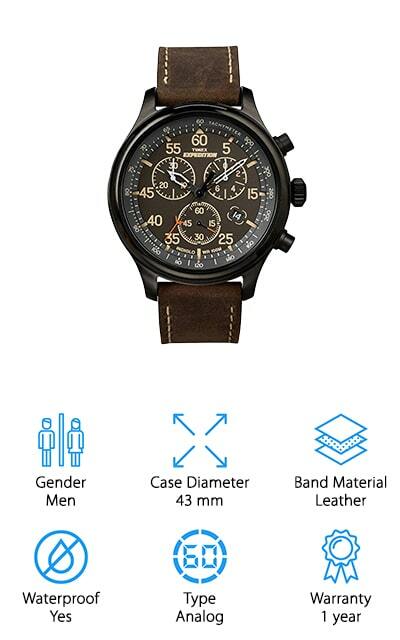 It has a 43 mm case diameter which is considered a moderate size and it has a leather band that is made to look great and stand up to anything. You can rely on the fact that this leather band is going to last for a very long time and well beyond the 1-year warranty that the watch comes with. It has a chronograph that can measure up to 30 minutes and there’s a light for use during the night or when you’re in a dark environment. Waterproof to 330 feet, this is actually a great watch for swimming and even for snorkeling. It’s an analog style watch but you’re definitely going to love the way that this quartz style watch keeps the time for you. This stylish women’s watch is actually shock resistant and waterproof to over 330 feet, which means you can take it with you swimming and snorkeling. It has a resin band that’s made to be comfortable and flexible while you’re wearing it and has a case diameter of 39.8 mm, which is a moderate size even for smaller wrists. The analog design of the watch is large enough that you can easily read it and there’s an LED light that lets you see even when it’s dark. You’ll have world time for 48 different cities and 31 different time zones and you get a pink color with silver accent that looks stylish and a whole lot of fun. This watch even comes with a 2-year warranty so you can count on its durability in the wilderness. 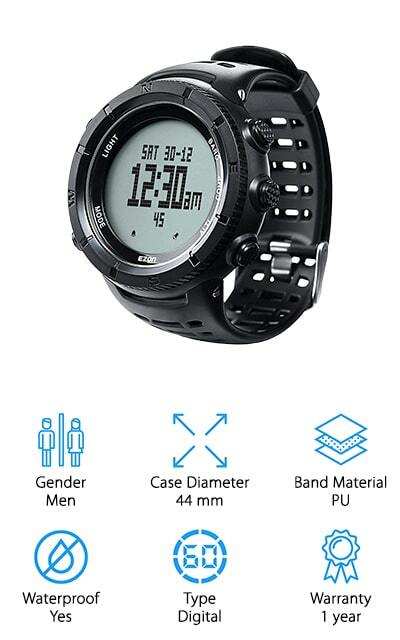 One of our top rated men’s outdoor watches, this one has a whole lot of features including a compass, barometer, thermometer, weather forecast, clock, world time, stopwatch, countdown timer, and altimeter as well as keeping track of sunrise and sunset. It’s waterproof to 164 feet so you can easily take it with you when you’re swimming, snorkeling and a whole lot more. You’ll love the band that’s made of PU material so it’s soft and durable and the case diameter is 44 mm, so it’s large enough for most but also not too large for those with a smaller wrist. The digital aspect of this watch makes it easy to read when you want to and the stainless steel back and buckle mean that it’s durable and long lasting. You can easily take it with you for a range of different activities and use it for outdoor events. This women’s watch definitely looks like it can do anything and it’s about ready to as well. The digital watch has a resin band and a 37 mm case diameter so it’s large enough to see and use easily but not too large for smaller wrists. This is actually one of the less expensive options out there and it has a 2-year warranty included, so you’re getting something high quality without having to spend a fortune at the same time. What’s even better are the great features. This watch is waterproof to 330 feet, which means you can even take it with you swimming or snorkeling. On top of that, it has a countdown timer and alarm and a stopwatch so you’ll have plenty of great features for anything you need. 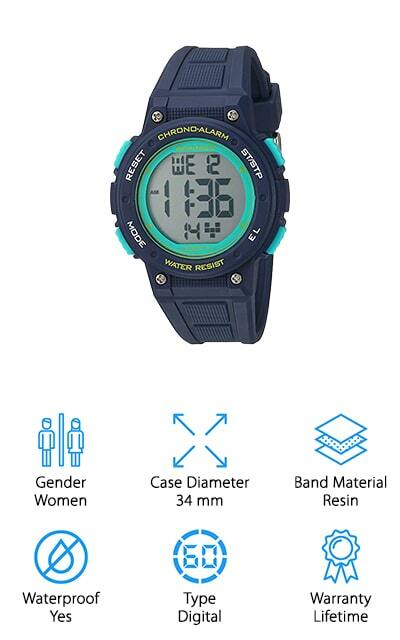 Here we have one of the top-rated outdoor watches for women, with several different color options to suit your personal preference. It has a 34 mm case diameter that’s smaller than some but fits well on just about any wrist. It’s also waterproof to 330 feet, which means you can take it along with you even when you’re swimming or snorkeling. The quartz movements are guaranteed to be high quality and to retain the time no matter what, while the digital readout makes it more convenient for most users. Here you’re going to get a full lifetime warranty that lets you know this is one company that is standing behind their products and providing you with something that you can count on. The resin band is also designed to be comfortable and flexible for different activities. If you’re really looking for versatility this watch may be exactly what you need. It’s a digital watch that comes in several different colors to fit your personal preference and style. 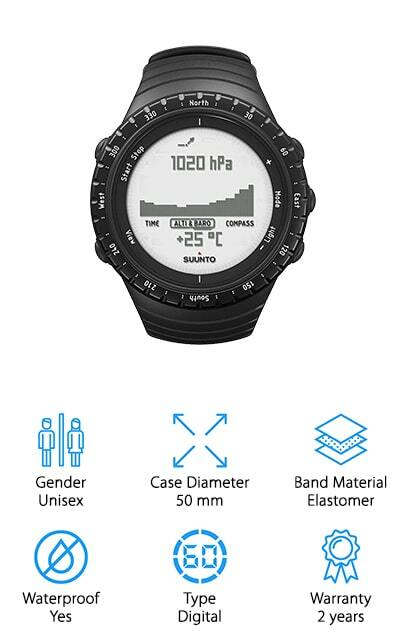 It also has a German sensor, weather forecast, altimeter and a whole lot more. You’ll have everything you could need to keep yourself going when the weather turns rough or even if you’re just outside camping or having fun with other activities. There’s a 6-month warranty that says everything is going to work just fine and the comfortable band is made to be flexible. With this watch, you’re getting a 45 mm case diameter that’s designed for moderate to larger wrists or those who prefer a larger watch. It’s something you’ll definitely want to take along with you when you head into the great outdoors next time.